Data on this website are updated every Friday by 4pm. Due to different reporting schedules, case totals here may not always reflect those reported by local health departments. Updates during the off season (January-April) are less frequent. April 17 - 23 is West Nile and Mosquito and Vector Control Awareness Week in California! This week highlights the importance of preventing mosquito bites and protecting Californians from mosquito-borne diseases. Stop by the "Fight the Bite" event at the State Capitol in Sacramento on Thursday, April 21st from 1:00 - 4:00pm for more information. Contact your local mosquito and vector control district to learn about events in your area. No cases of human WNV illness have been reported positive for WNV in 2019. No horses have tested positive for WNV in 2019. 1 dead bird from 1 county has tested positive for WNV in 2019. 1 mosquito sample from 1 county has tested positive for WNV in 2019. A mosquito sample may contain up to 50 individual mosquitoes. No sentinel chickens have tested positive for WNV in 2019. 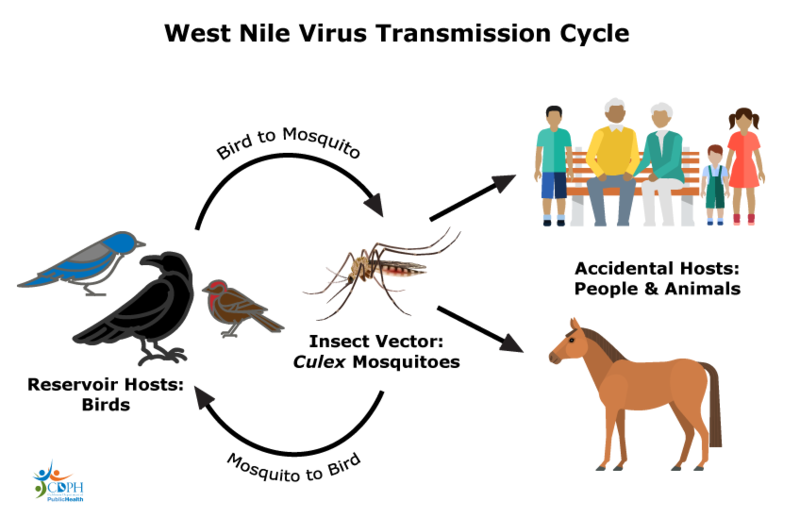 Help us track down the West Nile Virus by reporting all dead birds. You can submit an online report by clicking on the button on the right. 1 There were 20 imported human cases. 2 There were 3 imported horse cases. 3 Not monitored this year.